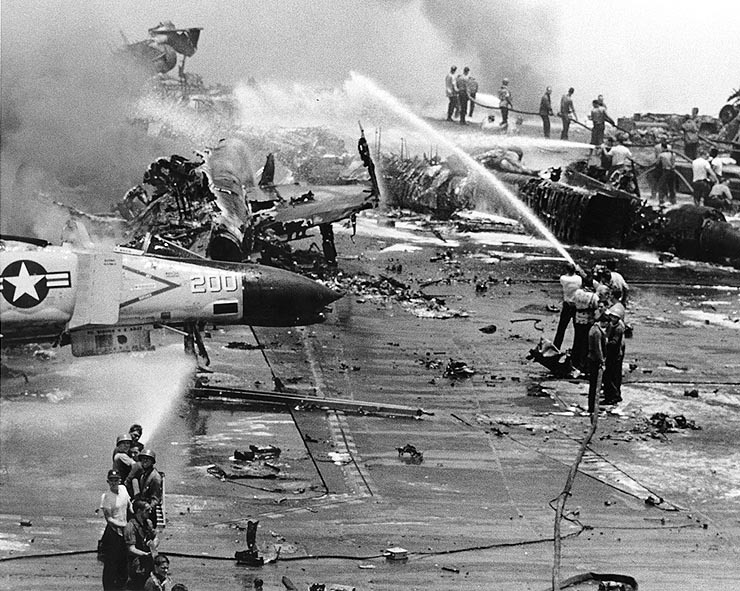 Crew members try to fight against the fires aboard USS Forrestal after the accident in 1967. This Image was released by the United States Navy with the ID USN 1124794. Public Domain. We are in the Gulf of Tonkin, 29 July 1967, United States is at war against Vietnam and US Navy attack aircraft daily bomb Vietcong positions. Suddenly, something happened. A small anomaly caused the discharge of a Zuni rocket on the flight deck. The hit on one aircraft triggered a chain-reaction of explosions in the rest of the parked aircrafts that killed 134 sailors and injured 161. The below figure shows the deck configuration of the U.S. aircraft carrier USS Forrestal (CVA-59) on 29 July 1967. By accident, a “Zuni” rocket was launched which led to a catastrophe that killed 134, and injured 62. 21 aircraft of Attack Carrier Air Wing 17 (CVW-17) (tail code “AA”) were destroyed. The deck setting and diagram was published in the Naval Aviation News, October 1967. Photo of public domain currently. The reports indicated that the most probable source of the Zuni rocket was F-4 No. 110. 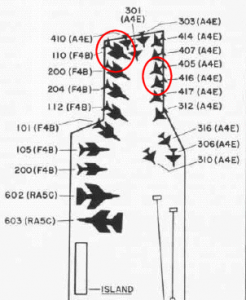 Note that White’s and McCain’s aircraft (A-4s No. 405 and 416, respectively) are in the right hand circle. Diagram showing the aircraft position at the moment of the accident and main damaged aircrafts. It was reported that likely the source of the rocket came from the F-4 No. 110. What Went Wrong aboard USS Forrestal on 29 July 1967? A small but important item called “triple ejector rack (TER)” is electrical safety pin that prevents any electrical signal from reaching the rockets. Some evidences suggested that high winds could sometimes catch the attached tags and blow them free. 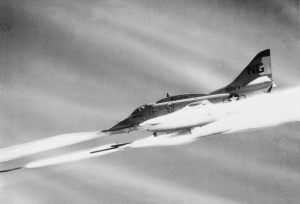 An VA-113 A-4F launching Zunis during the Battle of Khe Sanh, 1968. The backup was the “pigtail” connection of the electrical wiring to the rockets pod. Regulations required they be connected only when the aircraft was attached to the catapult and ready to launch. An investigation concluded that that four weeks before the fire, Forrestal‘s Weapons Coordination Board had a meeting to discuss the possible problem of a faulty pigtail delaying a mission while the aircraft was removed from the launcher. The board ruled that, in the future, the crew could ignore protocol and connect the pigtails while the aircraft were still queued. Though never made official, the crew immediately acted on the ruling. The conclusion was that the TER pin was likely blown free while the pigtail was connected, and that the missile fired due to a power surge when the pilot transferred his systems from external to internal power. New safety rules were quickly issued after this report to prevent more accidents. 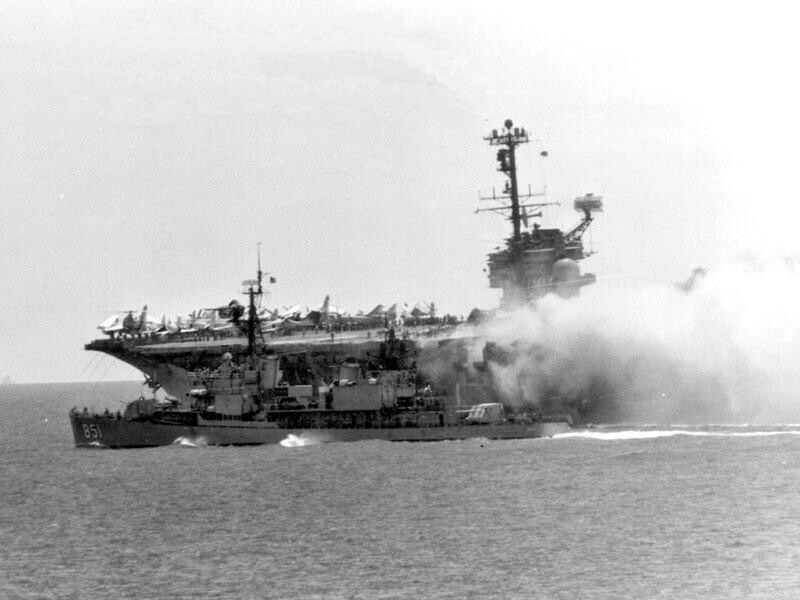 The destroyer USS Rupertus (DD-851) assists the USS Forrestal in flames. 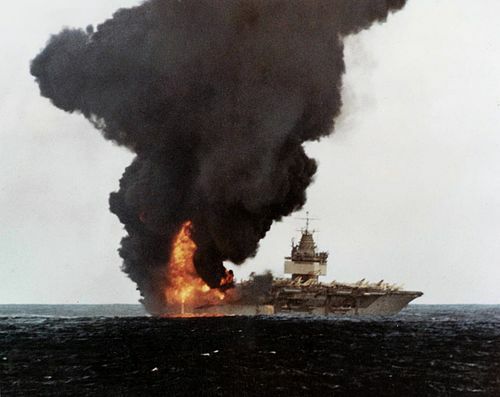 Stern view of the USS Forrestal in flames. Model kits for the Cv-59 USS Forrestal at different scales: 1/350 and 1/800.